This is a complete list of all of the cards in the game. If there is more than one of the card then the number is shown in brackets, indicating also how many are in the 'A', 'B', and 'C' decks if necessary. Only those cards with more complex effects have a detailed description. The rest should be easy to understand from the symbols on them. Bridge (2) - When you run your city you take an extra £1 for each face up brown card on your City Display. Brixton Prison - When activated you can expend up to three cards from your hand. For each card expended you reduce your poverty by one. The cards you expend should be placed on the Card Display. Coffee House (2) - You do not expend a card when you place this card on to your Building Display. When activated you select any card on the Card Display to place on top of it. The card you take can be of any color. You must still pay any money required to place the card. You can then activate the card just selected (or you can choose not to). Fire Brigade - When you activate this card every other player must pay £1 for each borough they occupy to the bank. 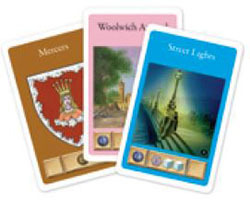 Fleet Street - When activated you choose one player. He must then take two poverty points from the stock. Hospital (1/2/0) - You can flip this card instead of the one you have just activated, thereby leaving the other card face up to be activated again in another turn. You cannot activate the card again this turn. Huguenots - When you choose to play cards, you can place this card on the discard pile and then take two cards into your hand. You do not have to use the power on the card, you could just expend it to allow you to place another card on to your Building Display. Jewish Immigrants (2) - Has the same effect as the Huguenots card. Leather Industry (2) - Lloyds of London - When activated you take £2 from every other player. Millbank Prison - When activated you can expend up to three cards from your hand. For each card expended you reduce your poverty by one AND you take one victory point. All of the expended cards must be placed on the Card Display. Omnibus (2) - When you run your city you take £1 for each borough that you have a building counter in. Parliament - Normally you must take one card at the start of your turn. If you have this card on your Building Display then you choose whether you wish to take zero, one, or two cards. Paupers (2/4/5) - Paupers are a problem. They are close to useless. As such your only options are to educate them with a school, use them to activate another card, send them to prison or the workhouse, or discard them if you go over nine cards. Police Force - When activated you give one of your poverty points to a player of your choice. Public Houses - When you run your city you do not gain any poverty points for cards you have in hand. You still incur poverty points for cards in hand at the end of the game. School (2/0/1) - You may pay £1 to expend a card of any color when placing a card in your Building Display. You may perform this action any number of times in your turn as long as this card is in view. Shops (0/2/2) - Whenever you place another card on to your Building Display you place £1 from the bank on to this card. You collect this money when you activate the card. Steamboats (2) - When activated you take £2 for each borough that you have a building counter in that is adjacent to the River Thames. Stock Exchange - Once during your turn you can take one card from the Card Display in exchange for one card from your hand (you cannot exchange cards with the deck). This power can be used no matter what action you have chosen for the turn. Town Houses (2) - When you run your city you score one victory point for each non-brown card face up on your display. Underground (5) - When you activate this card you must place two Underground counters on to the board. The very first Underground counter to be placed in the game must be placed in or adjacent to the City (which contains an Underground symbol to remind you of this). Once there is at least one Underground counter on the board, then all future counters must be placed so that they are adjacent to a borough already containing an Underground counter. It costs an extra £3 to place a counter across the River Thames. 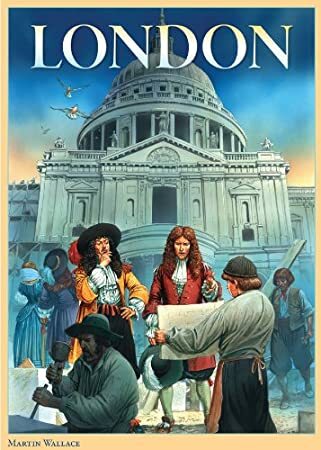 University of London - At the start of your turn, when you have to pick up one card, you can look at the top three cards from the deck. You can then choose one of these or one from the Card Display. You place the unselected cards back on the deck in an order of your choosing. If you also had the Parliament card on your display you could choose to keep two of the cards you looked at, or one of them and then take one from the Card Display. Whitehall - When activated this card allows you to activate another card on your Building Display that you have already activated in the present turn. You do not pay any money or expend a card to activate the other card. E.g. If you used this card to activate an Underground card for a second time, then you would not expend a card to do so. You cannot activate a card that has been flipped over in a previous turn. Workhouse - When activated you can expend as many Pauper cards as you wish. For each card you expend you take £1 and lose one poverty point. Wren - If you choose to play cards, then you can play this card from your hand on to the discard pile and then play another two cards from your hand on to your Building Display. The cards you play can be of any color. You must still pay any monetary costs associated with the cards that you play.